Last night I wept along with others at a candlelight vigil for a young man I’ve known only as “Irish”. I did not know till last night that his real name was Jamie Lee Gonterman. Every time I’d seen him at the homeless camp by the White River in Indianapolis, he would give me a hug and thank me profusely for the batteries and other necessities for outdoor survival that I had brought along to give to him and others who live in this camp. We’d sometimes talk about the possibilities of his future, how he’d like to move out of the camp someday into a safer place. I cared about him and had hoped for brighter days ahead for him. About a week ago, I was stricken with disbelief and grief by the news that he had died from the injury sustained in a fire that went out of control as he was trying to keep warm on a cold Winter night. As of this writing, the police department is still investigating the details of what happened, but what we know for sure is, over ninety percent of his body was burned, and within hours, his life and all the hope for a brighter future was gone. I was at a loss for words when I saw his parents and siblings a few moments before the candlelight vigil by the site where the homeless community has created a memorial for him and others who’d lost their lives while living there. I could only imagine the pain and anguish I would feel if it were one of my sons who’d been living at this camp and was burned to death. I held his sobbing mother and said “I’m so sorry”, but the words sounded hallow and felt so inadequate to express the deep sorrow engulfing us. To the city of Indianapolis, Irish was just another homeless transient who died this Winter, and only got a short blip in the evening news that didn’t even mention his name. I’m writing this blog to acknowledge that Irish was a person who mattered. He was his broken-hearted mother’s son, his siblings’ brother, and a friend to many who knew and loved him, and now feel his absence. Camping isn’t recreational when you have no choice about it, like these homeless folks in Indianapolis. 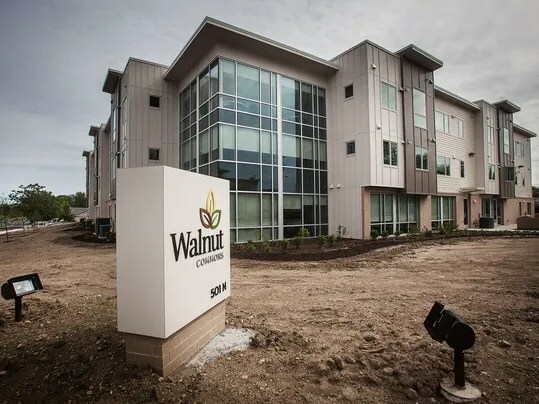 I was so happy when a friend showed me this news article about Walnut Commons in Muncie, Indiana. Walnut Commons is a new apartment community building with a medical center attached, especially designed to meet the needs of the homeless people and help them transition out of homelessness. I hope other cities across America would follow this example. This approach to homelessness has been proven to be effective in other cities, and I hope it will become a standard community service in every city in the U.S., just like public schools and police department. I see this as a very viable solution to the problem of homelessness in America. Newly-constructed Walnut Commons in Muncie, Indiana. Please click on the link below to find out more about this project, see more photos, and perhaps consider how you can help start something like this in the community where you live. If there were more compassionate and creative people like Veronika Scott, the problem of homelessness can become a thing of the past in America. To learn more about The Empowerment Plan, or to donate to the cause, please visit http://empowermentplan.org.